I am reposting my introduction (from the AikiWeb.com Forums) here, with a few edits, just to have everything in one place. In the next post I will bring things up to date. Some basic basics: I’m a 46 y/o woman in the San Diego area. Horseperson for fun. User experience analyst for a living. 30 lbs overweight. Sturdy and strong, but out of shape. Did a little Tang Soo Do in high school (through the 1st test). Loved it, but went off to college and left it behind. I recently came to Aikido via a book by Mark Rashid, a gifted horse trainer and author. I had been aware of Aikido before, but his book “Horsemanship Through Life” is what prompted me to begin studying it. I was originally hoping to improve my balance, fitness, awareness, relaxation, and breathing, all of which apply nicely to working with and riding horses. I got off to a bit of a rough start, with some muscle spasms after my first class. (Tip, don’t start with the longest class your dojo offers, esp. after weeks of being sick. Duh.) I got that cleared up with lots of gentle exercise and was back 4 days later, having a blast, and trying to slurp up information as fast as my brain could absorb it. Things went well for classes 2 and 3, and then in my 4th class I demonstrated some particularly horrid ukemi by landing smack on the top of my right shoulder. Much ice and pain later it seems I have a level 1 (minor) separation of the AC joint, so I’m down for a couple of weeks, at least. I can do whatever doesn’t hurt, but am not to push it. I am grateful to fellow AikiWeb citizens Mary Eastland, who posted about being annoyed with a broken wrist, and Darryl Bronson, who posted about having Aikido withdrawal after knee surgery. Aside from feeling less alone and sorry for myself, for being benched before the end of my 2nd week, I now have lots of ideas for productive ways to use the time. I will be continuing to go to class, watching, taking notes, and learning everything I can. As my shoulder improves I’ll join in one-sided or somehow just work on those things I can do. I’ve had a shoulder problem before. With proper care and PT it healed fine. This will too. 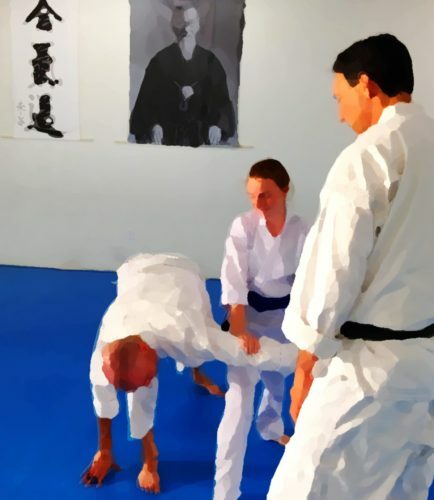 Aikido in general, and my dojo in particular (Aikido of San Diego), felt like the right choices from the first moment, and everything since has confirmed that. Yes, the simple things I had hoped to address in my life and riding are there, but there’s so much more depth to the art than I had considered. The more I learn, the more I find that Aikido applies to every aspect of living, in a way that harmonizes with my temperament. The people I’ve met through Aikido (both in the dojo, and online) have been universally smart, thoughtful, kind, patient, and a lot of fun. I am looking forward to a very long and interesting journey, and to getting to know people here. And I promise to try to not be so long-winded every time I post. The similarities between Aikido and horsemanship are really stunning. I’m working (slowly) toward doing dressage, which is basically a martial art in which harmony with the horse is the goal. Dressage tests are very much like kata – demonstrations of a set of skills at each level. Nervousness, confusion, or annoyance on the part of the horse are counted against your score. Training a horse is a little like teaching it ukemi – to follow the feel you are offering. It’s funny, I have pretty good “eyes in the back of my head” for sensing what my horse might be up to next, but when we try to anticipate an attack in class (respond as soon at uke moves toward us) I’m pathetically slow. It’ll come with time, I suppose. By the way, I also have donkeys. They will teach one patience. And they respond so much better to trust and polite requests than to authority and force. Besides, they are smart, and cute. I’ve not played with weapons yet, but I’m guessing years of forking manure has got to help with jo work. We’ll see.